Acquired the carrier to transport a 3500 watt generator on a Ford F450. Assembly instructions are straightforward and easy to follow. Pin alignment when securing the carrier in either position is a bit challenging - had to wiggle it back and forth - but once pinned, the carrier road well (in the stored position). It does require a standard two inch receiver - mine was a 2.5 inch receiver with adapter sleeve so I had to do a little adjustment for the anti-rattle device to work. Even so, the system is good quality per price. Construction is sound but I would recommend not pushing the weight limits. It does double for a nice access ramp for walking up to enter the shell we have in the back of the pickup. Using two adjustable jack stands provide stability when on the job site. Good product at a decent price. eTrailer was excellent to do business with too. They notified me via email my item was in stock and when it shipped. No regrets. We recently sold our station wagon that served as the vehicle we used for hauling things that didn't fit in the trunk of our cars. This includes a walk behind mower that gets transported a lot. The cargo carrier is the perfect solution and actually makes things easier for loading and unloading as it is closer to the ground. We also have the perfect storage area in the garage between the freezer and the wall. Out of sight but still easy to get to. Wish we would have thought about this sooner. One other note, the purchasing experience with e-trailer could not have been better. Easy to navigate website, very fast shipping, and awesome communication throughout. Exceptional strength and capacity. Ease of assembly and good appearance. Protective coating could have been more durable.I would recommend this product. After assembling I tried to install the carrier on my Malibu. DID NOT FIT !!! I had to order an extension to be able to make it work. Another $30. I thought that after inputting type of car that items ordered from you we're matched to fit my car. You should make it clear. Now I'll try to get my $20 rebate. Wish me luck !! This basket is TOUGH! It holds a huge 6p tent, a 2p tent, a 60 pound deep cycle battery, a bag of tools, and an air mattress when we tent camp around the country. This basket has seen about 8,000 miles across 24 states. It's scraped the ground over 100 times and the bolts got tweaked. I sawed them off and replaced them with round headed bolts upside down so it will skid on the round head instead of the ground catching the threads and bending the bolts. I seriously cannot believe this basket is still intact! It's been through absolute hell and it's held up. It's due for a painting and she'll be like new. On my 2011 Yaris, it blocks the license plate so I could potentially be giving a bored cop a reason to pull me over. Sometimes I zip tie my license plate to the basket when I'm in a bigger city. At night, I use one of those 12 volt license plate lights and connect that to my battery in the basket. This was a great investment and I'm damn glad to have it. The basket took a BEATING and it took it like a champ. I ended up selling it on [used item site] when I upgraded vehicles to a very happy customer. This is exactly what I was looking for to add a little extra space to my 2011 Toyota Rav4. It was extremely easy to put together and install. It is strong enough that I even added my canoe racks to the side bars so now I can have the storage and have my boat racks on top as well. I was expecting a lot more road noise but I cant really tell the difference. So far so good. eTrailer had fast, free shipping and it was right on time and packaged well. THis has been one of my best ever e-commerce experiences. The website was well organized, informative and easy to use. The ordering process was simple and efficient and the order arrived so fast that I was amazed. he produce arrived exactly on time and as described. Assembly was easy and tok maybe 15 minutes half of which was finding the right size metric wrenches and sockets. Best of all the fit to my Subaru Forester was great because it did not block the license plate or taillights and was not directly inline with the exhaust. I usually try to buy locally but this product was not avaialble locally. I was extremely pleased with the experience and the product. Just right!!! It works great. Perfect. Took some finessing to tighten down the bolts but I did it on my own. I used it to move about 250lbs worth of belongings in containers from NY to FL (Little over 1,300 Miles). Easy to assemble. Reversed the bolts so the threads and nuts don't stick into a carrier bag. We purchased the cargo carrier as an experiment to haul around a paint machine we use to paint lines on our athletic fields. The grounds crew couldn't be happier with the combination of lightweight, function and overall ruggedness of the unit. Nice and lightweight so even a weaker person can lift it and put it on. Etrailer.com is awesome. UPS damaged the box and all the hardware was missing. Had it within 2 days from ETrailer! Great place, nice product. This basket carrier is built with heavy gauge metal and is very sturdy when it is put together. I added some flat washers for a professional job and I was done. I am very pleased. Thank You ( etrailer.com ) for filling the bill, fast and with quality. Thank you for the great product and good advice about tongue weight and safety matters related to carrying two electric bikes. Your help was fantastic and it was a pleasure to do business with you. We're taking a round the country trip in the 2016 Miata this summer and needed more space. I made fixtures to attach it to the top of the Time Out tent trailer. The top of the Thule is very flexible so closing it takes a little work to latch the locks. Otherwise would have gotten 5 stars. I once had an old Yakima Cargo Box (white on top & gray bottom) & I backed out of my car port w/its lid open~~of course, I totaled it! So, I chose the small Thule Cargo Box & was disappointed in its construction. 1). The box was very flexible due to its light construction. 2). The box comes w/two locks. Couldn't get the rear lock to catch because either the lock-arm was too short or the catch mechanism was riveted too low. Anyway my Yakima was of sturdy plastic which I had for a number or years. It held about 15 cubic feet of gear instead of the 8 that this product holds. I wouldn't recommend this product to any of my friends. Our family of 4 took two trips with this box. One was a week-long driving/camping trip from Texas to Appalachian Mountains. It has plenty of room for sleeping bags/tent/chairs/misc. We drove about 80 mph on open highway, drove through rainstorms and had no problems. I have a 2013 Toyota 4Runner and needed to buy crossbars that fit my vehicle before installing the box. I learned not to leave loose clothing in the cargo box while driving on the highway. Small clothing can get sucked out of the small sliver of an opening created along the side while driving fast. Now I put towels, dirty clothes in a duffel bag to prevent this. Remember to avoid parking garages! Here are a few pictures of the Aero XL cargo box. I had just installed it on our H3 Hummer. It’s been a year now and still working great. I’ve never taken it off since I’ve had it so it’s gone thru 2 winters no rust or anything. Recently loaded it up and drove 3100 miles round trip and it held well. Quick Shipping, easy to put together. Installed on our 2014 Jetta Sportswagen TDI with panoramic sunroof. There is not enough clearance to open sunroof when installed. I am going to look at modifying bottom part of bracket. Overall, love the look and style for the Sportswagen. 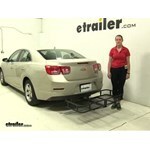 Great hitch equip hauler use it with our Toyota Matrix now that the dog rides in the back. good amount of space- no complaints! easy to assemble and install. Product arrived without hardware. One call and hardware was shipped same day. Nice basket but think it could use 4 inch rise for use on Chevy Cruze Sedan. Only 9 inches of ground. Had to assemble and was able to do so rather easily, however the instructions were a bit vague. It will work for what I want it to do. I am using it on the front of my pickup to carry a 50cc Vespa. I'm going to use an extra strap attached to my brush guard, pulling back, to ensure the scooter doesn't try to roll forward. First, let me say that I dealt with two different people in placing my order. The reason being? I was trying to find a motorcycle rack that would accommodate my BMW G310GS (374 lbs curb weight) on the back of a Class C RV. I tried MANY different companies and NONE but etrailer came through for me. All of the previous companies - and there were lots said they couldn't help me, or couldn't recommend a rack for the back of a Class C RV. I was pretty frustrated at this point and when I found one on etrailer that looked like it might work, I was still paranoid that it wouldn't. The first person I worked with offered to call the manufacturer and verify it would be recommend for the back of a Class C RV. Now the amazing thing, they actually call back - that day! I couldn't take the call, so listen to a voice mail. When I called back I was dealing with a second person Meghan, who was dialed in on what I needed and how to get there. I also wanted an anti-rattle gizmo that goes inside your vehicle's trailer receiver. Wasn't clear to me exactly was the dimensions represented in relation to my vehicle. So......... Meghan was VERY patient as I literally went outside to my RV with a tape measure and we conferred on whether the part would fit my vehicle. Double Score: Rack that will work with my Class C RV and the anti-rattle gimzo. Great customer service, and humor to boot!! So.....I am very happy to anoint Meghan as my HERO OF THE DAY. Ya done good! First, the assembly was really super easy and quick. Our plan is to use the rack behind our travel trailer to hold coolers so we can stop hurting our backs by not having to lift them into the truck bed. This rack will make that so much easier and we will be able to fill the coolers with more ICE. We also chose this rack because of its 60" width. Now this rack will hold both coolers. Great Rack! The rack is working great! It is still behind our camper and we use it for coolers in the summer and then to haul deer home during hunting season. 27x47 MaxxTow Cargo Carrier w/ 60" Pivoting Ramp - 2" Hitches - Aluminum - 500 lbs. works good better than I thought. Put together today, love it, all worked out great, thanks etrailer. Price was great too.. I got my package, was pleased with the delivery time.opened up,every thing in package looked good.im working on assembly today. thank you! Purchased this for our 2014 Subaru Impreza Hatchback with fixed OEM cross bars. This MaxxTow Cargo Basket is very good quality materials and assembled easily. I love that the rubber covers for the joints which will help keep everything dry and rust free. I recommend putting Lock-tite on the screws to prevent them from loosening if you leave the rack on for any period of time. This basket looks awesome on the car! Easy to mount and very sturdy on the cargo bars. Curt Waterproof Bag C18220 fits literally perfect in this basket. Thanks etrailer for the recommendation! I bought this cargo basket as it was the least expensive, I was not sure how it would fit in with my needs. I roof mounted it on a UTV. I needed to modify the mounts, but this was an easy fix. I very happy with the way the MaxxTow Cargo Basket worked out. This rack is small & light, but its built well. Fits and works on my Teryx 4, UTV. I would recommend the MaxxTow Basket, for this type of use, even though it needed the mounts changed around. 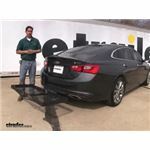 Today on our 2016 Chevrolet Malibu we're going to be taking a look at the Curt 20 x 48 Cargo Carrier, part number C18110. Now these cargo carriers are going to be great for freeing up space in your vehicle for passengers or pets, or maybe just getting all your dirty, keeping it outside, and not dirtying up the interior of your car. Now our cargo carrier's made out of a strong, durable steel construction and it has a nice black powder coat finish so it's going to resist rust and corrosion. Now all along the edge here we're going to have multiple tie-down points so we're going to always have somewhere to secure our gear when we're ready to tie it down. I'd like to give you a few measurements just so we know how much we're actually going to be adding to the length of our vehicle. Now from the most outer edge of our bumper this is going to come right about to 25". Now the closest point to our vehicle, it's going to be just a little bit under 6" right here. Today on our 2015 Chevrolet Malibu, we're doing a test fit of the Surco Cargo Carrier, part number 52017 for one and a quarter hitches only. Those dimensions are 20 by 48 and it can hold up to 200 pounds. Let's take a few measurements. I'll show you a few things here. The first measurement I'd like to show you, closure to our bumper to our cargo carrier, that's two and a half inches. Overall, we've added 24 inches and for our ground clearance, I'm showing eight and a half inches. Like I said, this is made out of a sturdy steel. Today on our 2014 Chevrolet Malibu, we're doing a test fit of the Surco Cargo carrier. This is 20 by 48, has a weight capacity of 300 pounds and works with inch and a quarter hitches only. That part number is 52017. The first thing we're going to do here is take a few measurements. Starting off with our ground clearance, we're going to have about 10 inches down there. Overall to our vehicle we're adding about 23 inches and our closet point is going to be about an inch and a quarter away there. Today on our 2014 Malibu, we're going to be test fitting the 17x46 Curt Cargo Carrier. They designed this for use in inch and a quarter hitches, it also has the two inch adapter if you want to go from one car to another with it. They offer up to a five hundred pound weight capacity with it. The part number is: C18145. To begin the test fit, you just slide the shank right into the receiver tube of our hitch. Now we want to slide it in far enough so that the threaded hole lines up with our hitch pin hole. 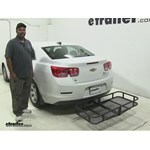 Today, on our 2009 Chevrolet Malibu, we'll be doing a test fit of the Rola-Cargo carrier. That's part number 59507. 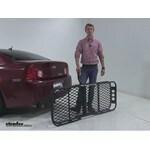 Its dimensions are 21 by 55, it has a nice weight capacity of 300 pounds and it's for inch and a quarter hitches only. That's going to be class II only, that is. Let's go ahead and begin our test fit by sliding the shank into the receiver and line up our pinholes. Just going to work our way in. For your 2015 Chevy Malibu we have just what you'd need. The best bang-for-your-buck roof rack we offer is the Rhino Rack part numbers # RRVA126B-2, # RRRLKVA and # DK338 which is a confirmed custom fit. Then for a cargo basket that would fit the rack and allow you to place your bag on top you'd want the Rola part # 59504 which would fit and work great. The Reese Cargo Carrier # 63155 referenced in your question weighs 38 pounds. This sturdy steel carrier features a weight capacity of 300 pounds and inside (usable) dimensions of 47-7/8 inches long, 20 inches wide, and 5-1/2 inches tall. I have attached a short video demonstration that you can also check out. The Rola Hitch Cargo Carrier # 59507 that you referenced weighs 69 lbs. I attached a review video for this product for you to check out. The Pro Series Cargo Carrier # 63155 that you referenced has a distance of 11 inches from the center of the hitch pin hole out to the nearest edge of the cargo carrier. So it should work on your 2012 Chevy Malibu since you have a distance of 7-1/4 inches from the center of the hitch pin to the furthest edge of the rear bumper. This is the BEST Cargo Carrier I have ever seen - from engineering to looks to capacity. It exemplifies the old addage the you get what you pay for.. You guys were a pleasure to deal with in this transaction. Your follow-up emails on status of the delivery were much appreciated - and very professional. Keep up the good work!